* Lime In The Coconut: ...Feeling Bleu? Beach debris. Nothing more, right? 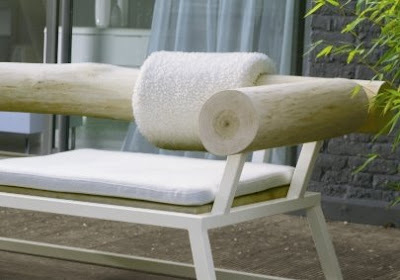 This innovative company produces a stylish eco-friendly furniture range made from repurposed wood, and designed by three French artists...Frank Lefebvre, Bastien Taillard and Laurence Glorieux. "All Bleu Nature creations are born of an encounter between the technical mastery of a French craftsman and the prolonged work of nature. 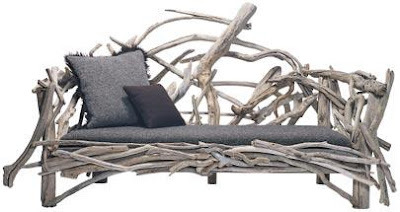 Nature has fashioned each piece of driftwood over time, rendering every item we produce unique in both form and dimension"
looking for any and all lost, drifted wood. Large or small. Twisted or straight. Not a bad job...I could happily apply. And gives each a new life. New soul. nice and interesting - i love the mirror and the lamp!!! The lamp in the last picture is just beautiful! I agree...lamp is fantastic and I could see it and the bench in your casa! I love the lamp and the white/wooden chair. What a natural beauty. It would be a lovely job, walking around the beach looking for pieces of driftwood. I can apply for the job with you. 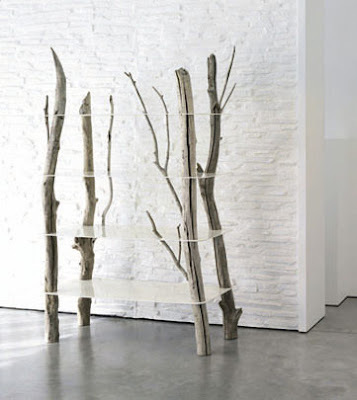 I like the glass shelves with the driftwood posts. I wonder if they're hiring world-beach-combers. I could be persuaded to spend my days collecting driftwood. . . It has such a serene feeling. Very different but I am liking it! We're looking for smaller pieces of driftwood from the lake. J found two larger pieces, that will figure into the condo redo, in a sculptural sort of way. One is slated for the deck, where we moved the wicker chest from the bedroom. More on that project as the weather warms. The other piece, smaller, is now atop the wine cabinet. Still deciding on that one. Oh I love driftwod! I grew up with my Mother packing it in cubby holes in the trunk of the car while on vacations- much to my Father's chagrin! She grew up in Hawaii so I think it was in her DNA to walk the beach picking up driftwood! It rubbed off- we collect "forestwood" and the occasional river driftwood- I have urns filled with the beautiful pieces. I love the chandelier! I'm thinking "project" for dear husband!!! Gorgeous! Soft and rugged all at the same time. These are so cool! If I saw them in someone's home I'd be fascinated, so pretty. Isn't it interesting how this hard material can appear so soft. The combination with modern elements are perfect. thanks for opening my EYES to this company! love the mirror - it is AhhhmaZzzing!!! I love seeing the creativity of the repurposed wood - the minds of these people have to be like so full of good ideas, it would cause headaches or something...wow! Coastal Nest is going to be making something great when the sea is a little more on the calm side, in a few months!! Its just so not tropical out here.EVER, your photos are so wonderful! I promise to use the driftwood for more than the bonfire this year.. 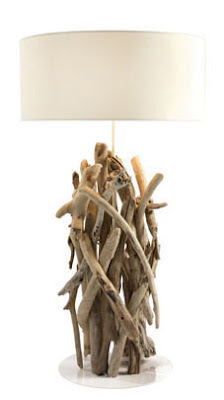 I love all the shades of grey in the driftwood & the lamp is great! Happy New Year from Texas!!! I really like the glass shelves and the round chandelier. Such creativity!! Those are really cool pieces, Linda. I especially love the lamp and chandeliers. purrrrrrrrrr..... must. have. it. all. you have exquisite taste, dahling. 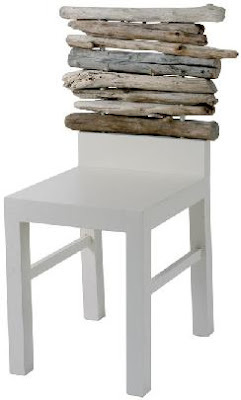 Very interesting as a beach lover I had neglected driftwood. It is indeed so beautiful and it does seem to evoke peaceful, serene living. I am so thrilled I have discovered your blog - what a great collection of beautiful and inspiring things! As a new blogger I can't believe all the great stuff I've been missing out on! I see you're a fellow Floridian...so be sure and enter my giveaway for tropical style notecards at myflipflopz.blogspot.com. I'll look forward to many more gorgeous posts! The furniture looks interesting but not too comfy ha ha. 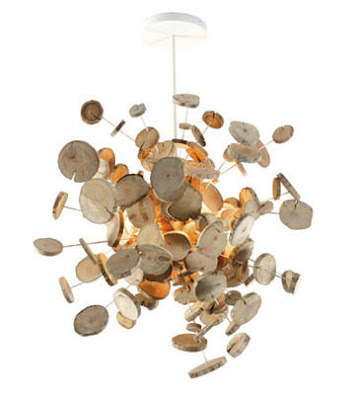 But the lamps and mirrors and other accents are easy on the eyes (and the rest of the body ha ha) for sure! 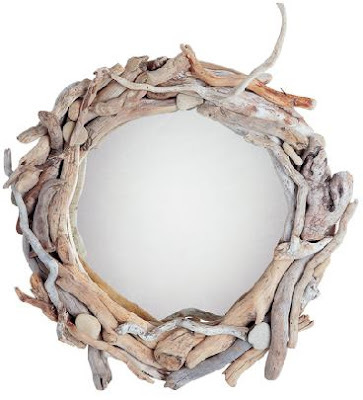 so many things i feel i need now... starting with a beach house and endless driftwood! 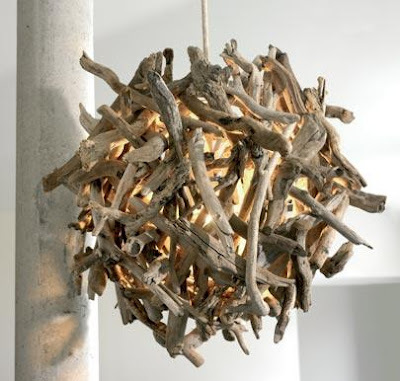 So innovative and clever to work with driftwood, xv. in this wee, northern florida town. if i am not mistaken!!!! Linda how is the camera coming along? I LOVE bringing things from nature into the house, it makes me feel more connected to my life! Great finds! 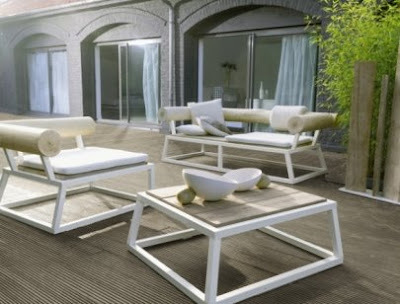 We just found your blog and read your nice article about BLEU NATURE... and we would like to thank you for your great presentation of our products ! If your want, you can contact our U.S. agent Mr Gael Pervilhac (gpervilhac@edgemarkets.com). Do not hesitate to ask us if you need pictures and other informations about our french company. We would be pleased to appear again in your nice blog !